Use simple tools to create colorful and educational toys with free wooden puzzle plans for kids. A jigsaw, sandpaper, paints and scrap lumber are all you need for building simple and fun toys for the kids. Use non-toxic paints and stains to finish your projects and be sure to sand all sharp edges. These charming and functional toys are great for craft shows and fundraisers. Children love the bright colors and parents appreciate the durable, long-life quality of wooden toys. From alligators to zebras, there is sure to be a character the kids will love. Simple skills and tools can turn bits of plywood or stock lumber into educational and engaging projects that children will use for years. Get the whole family involved in the project and turn a rainy weekend into fun time with free wooden puzzle plans for kids. 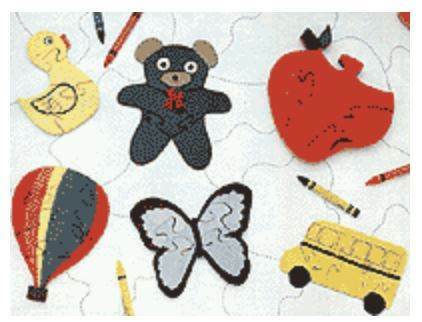 Create an apple, school bus, bear, duck, air balloon or butterfly puzzle for your toddler. 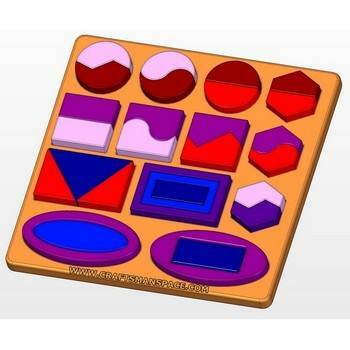 Parts list, diagrams and pictures to build a board with geometrical shapes. Build these easy animal puzzles that are thick enough to stand on their own when put together.